Next-generation sequencing technologies have transformed the way we study rare genetic disorders. Exome sequencing for Mendelian disease is the poster child for success in this arena. However, despite the frenzied pace of disease gene discovery and the growth of public sequence databases, the diagnostic/success rates for exome sequencing have remained somewhat constant over the past several years. Depending on the type of disorder, available samples, mode of inheritance, and other factors, one can expect that ~35-50% of clinical cases may be solved by exome sequencing. On the research side, the success rates for rare disease studies have often gone down, for the simple reason that as we improve the catalogue of disease-causing genes/mutations, genetic tests become increasingly effective. In other words, easy-to-solve cases never make it to a research study. The cases that do make it through, while valuable for gene discovery, will almost certainly have a low success rate. Knowing this intellectually does not make it any less frustrating when you can’t solve a rare disease patient or family where there’s clearly something to find. When an exome is negative, what recourse do we have? Whole-genome sequencing is often what researchers consider pursuing next — in theory, it enables the detection of variants that are not detectable by exome sequencing (e.g. in the 5-10% of coding bases that exome sequencing does not sufficiently cover, or structural variants with noncoding breakpoints). Yet the “rescue rate” of WGS for negative exome cases has been disappointing. Transcriptome sequencing offers a possible alternative to further investigate negative exome cases. For certain categories of variants (e.g. nonsense, frameshift, and splice site mutations), RNA-seq can provide a molecular confirmation of the predicted pathogenic effect. This is especially helpful in the gray area of splice-region variants, the effect of which is difficult to assess from genomic information alone. A recent paper from the MacArthur lab demonstrates the utility of RNA-seq in patients with genetically undiagnosed rare muscular disorders. They applied RNA-seq to muscle tissue from 50 unsolved cases. Four of these had a splice region variant of uncertain significance. Another 12 had a strong candidate gene based on clinical presentation and/or the presence of a single pathogenic variant in a known recessive gene. The majority (34) had undergone exome/genome sequencing but yielded no candidates. First, the straightforward analysis. In the four cases with candidate variants in the extended splice region (i.e. 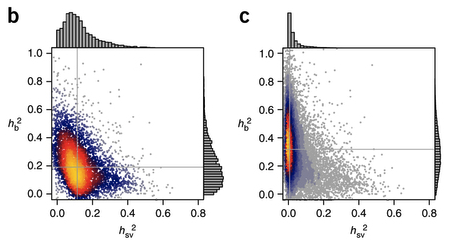 not the canonical splice site, but close to it), RNA-seq confirmed pathogenicity in 2 of them. This is a small sample size, so all it really does is highlight the difficulty of predicting variant effects outside of the canonical splice site. The real power of RNA-seq in cases like these is to identify novel splicing events that are not due to obvious splice site/region variants. 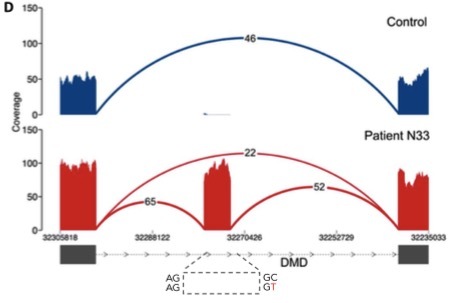 In seven patients, the authors of this study identified aberrant splicing caused by deep intronic variants in known disease genes (DMD and COL6A1). Intronic splice gain in patient N33 caused by a C>T donor splice site–creating deep intronic variant. RNA-seq is really the only approach that can identify an event like this. Exome sequencing doesn’t cover this region. Whole-genome sequencing does, but undoubtedly will return dozens of intronic variants, most of which have no effect on splicing. Overall, transcriptome sequencing enabled the diagnosis of 17 patients, or 34%. This rate is skewed a bit high by cases with candidate splice region variants (2/4 solved) and cases in which there was already a strong candidate gene (66%). Among cases without such strong leads, the rescue rate was 21%. This is a not-inconsiderable improvement to the overall diagnostic rate, and a strong argument that RNA-seq should be considered as a possible next step when exome sequencing alone does not achieve a diagnosis. It should be noted that muscular disorders were well-suited to a transcriptome approach, because the relevant tissue is both accessible and often already banked due to the fact that muscle biopsy is a routine (if painful) diagnostic procedure. For other types of rare disorders, one may not have this luxury. In retinitis pigmentosa, for example, the relevant tissue is the retina. Good luck getting any RP patients to volunteer any of their diminishing retinal cells. Developmental timing is also a consideration: for some disorders, like birth defects, the genetic aberration affects a certain phase of development that is no longer ongoing when the patient is in the hospital. You’ll note that the figures shared in this post also included, in blue, the splice pattern observed in normal individuals. These were gleaned from a subset of the skeletal muscle samples sequenced by the GTex consortium that were carefully matched to the patient specimens. 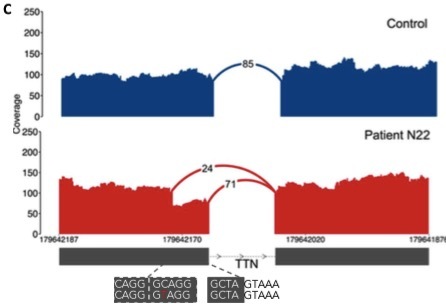 A tissue-matched normal is incredibly powerful for analyses such as this one, and reinforces the need for more large-scale efforts to put transcriptome data in the public domain. One significant challenges accompanied by advances in high-throughput genomic technologies (i.e. high-density arrays and next-gen sequencing) is that the speed at which we can detect candidate variants outstrips our ability to interpret their effect on phenotypes. In other words, genomic discovery is fast, but functional validation is slow. Also, the relationship between a sequence variant and an observable human trait tends to be complex, making it difficult to elucidate the mechanisms underlying an association. Gene expression offers an appealing intermediate phenotype. It’s influenced by sequence variation, quantifiable, and can be assayed in high-throughput fashion. Early systematic efforts to identify expression quantitative trait loci (eQTLs) revealed some fascinating insights into the genetic regulation of gene expression, such as the fact that much of that genetic control occurs in noncoding regions. Also, most eQTLs were identified in proximity to the affected gene (cis-eQTLs), but some were millions of base pairs away or on other chromosomes entirely (trans-eQTLs). Most eQTL surveys conducted thus far are limited to a certain cell type — most often, lymphoblastoid cell lines — and utilize genetic information from SNP arrays or low-pass whole genome sequencing (WGS). That’s why I’ve been excited to see the results of the Genotype-Tissue Expression (GTEx) project, which has applied RNA-seq to numerous different human tissues from donors that also underwent genome sequencing. In addition to a wide set of tissues profiled, their WGS data allows for a fairly comprehensive interrogation of genomic variation including large structural variants (SVs). 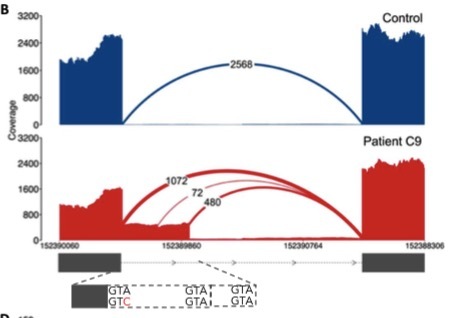 In the latest issue of Nature Genetics, members of the GTEx consortium led by several of my former WashU colleagues report the most extensive study to date of the impact of structural variation on gene expression. Their dataset comprises RNA-seq from 13 different tissues along with deep WGS (blood) from a total of 147 individuals. A strength of this study is that the authors have considerable expertise in identifying SVs from genome sequencing data. Across the 147 individuals, they identified 23,602 high-confidence SVs, including deletions, duplications, inversions, and other SVs. Of the 9,000 common SVs (MAF>0.05) in their dataset, 1,634 were associated with gene expression variation in at least one tissue. Because an SV can influence gene expression in multiple tissues and vice-versa, their complete analysis uncovered 5,128 individual eQTLs affecting 2,064 different genes. That’s a nice result if not an altogether surprising one, since you’d hope that changing the genomic copy number of a gene would alter its expression in somewhat predictable ways. 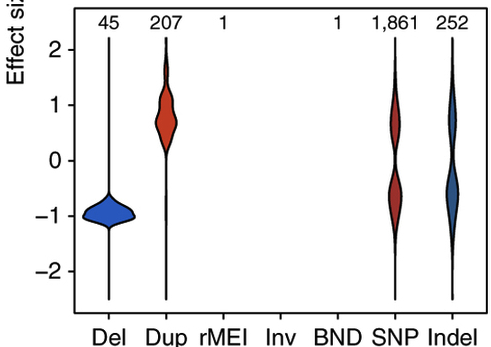 The authors also identified eQTLs involving SNVs and small indels, which are more numerous and generally easier to detect than SVs with current next-gen sequencing technologies. This offered a more complete picture of genomic variants affecting gene expression, and allowed them to characterize the relative contribution of each type of variant to eQTLs. Using fine-mapping approaches, Chiang et al found that for 3.5 to 6.8% of cases, a structural variant was the probable causal variant. This might seem like a trivial contribution, but remember that the typical human genome harbors ~4 million SNVs and indels, but just 5-10,000 SVs. On a per-variant basis, an SV was 28 to 54 times more likely to modulate gene expression than an SNV or indel. Moreover, this is probably an under-estimate of the contribution of SVs, since our ability to detect/genotype them with current WGS technologies is considerably less than our ability to detect smaller variants. Overall, this study beautifully illustrates the important role that structural variants have in modulating gene expression. It also lends additional evidence to what I’ve been saying for a long time: that noncoding regulatory variants probably underlie the majority of inter-individual differences in humans.